Writing is personal. I’ll start by getting that out of the way. We each have our own method for working. The same goes for keywords. In this post, I will show you what works for me. Today’s topic describes how to Use Keywords to Jump Start Your Blog Posts. The Periscope broadcast from 14 January 2016 that discusses this blog post is on YouTube and below. First, we’ll discuss categories and tags. Next, I’ll show you how I put together a blog post. I’ll use next Monday’s motivational and inspirational post as the example. Think of categories as the recipe title, and the tags as the ingredients in the recipe. Those topics will be your categories. Your tags can be anything that describes your post. Both categories and tags are keywords. Please refer to my earlier post to learn how to use Keywords for Small Businesses and Solopreneurs. If you are stuck deciding on what categories or tags to use, apply the techniques I demonstrated in that keywords post to determine your categories and then a series of relevant tags. Yes, using tags that are search phrases is a good idea and will help make your content findable. Give yourself some leeway when you are first writing. I have had several blogs over the years. I find that each blog develops its own “personality”. 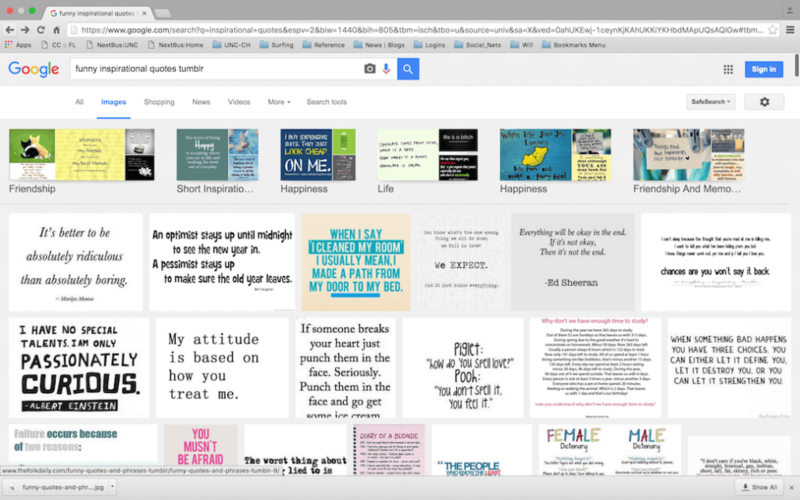 The specific topics and keywords develop over time as I write and the blog develops its own character. 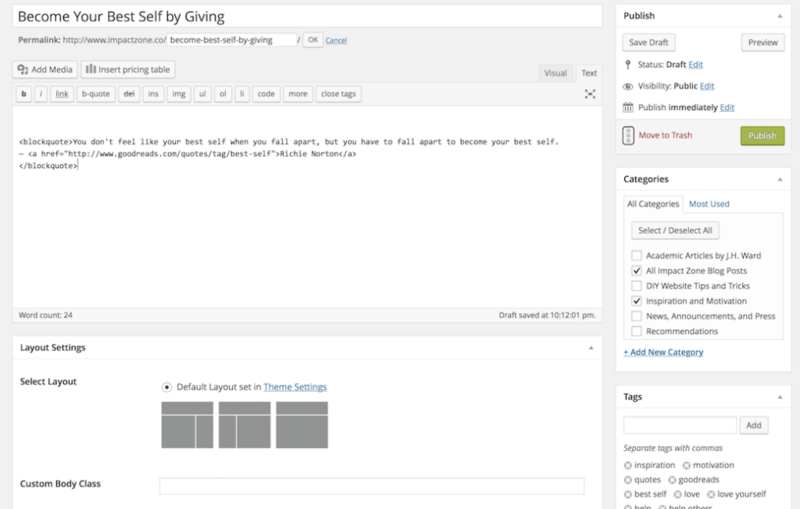 You will want to use a minimum of five tags per post, but no more than 15. Too little, and you don’t give the crawlers a good description of your content. If you use more than 15 tags, then you are over-describing. I aim for around 11-12 tags per post, plus the category designation. Yes, you can assign a blog to more than one category, but I would not assign it to more than three. Again, like with tags, less is more. If you would like to learn more about Categories and Tags and how to organize your website, David Alvarez has this great article on SEO Silos. Again, writing is personal. In this section, I’ll describe one approach. Think of a topic you would like to write about. Then, research words or phrases related to it. In this example, my post is motivational and inspirational. I release one every Monday morning. In keeping with that category and the sunset used in my previous post on how to use keywords, I am going to find an inspirational quote to build on. My model is that I find a quote by someone else, build around the theme of that quote, and then have a nice photo to go with it. 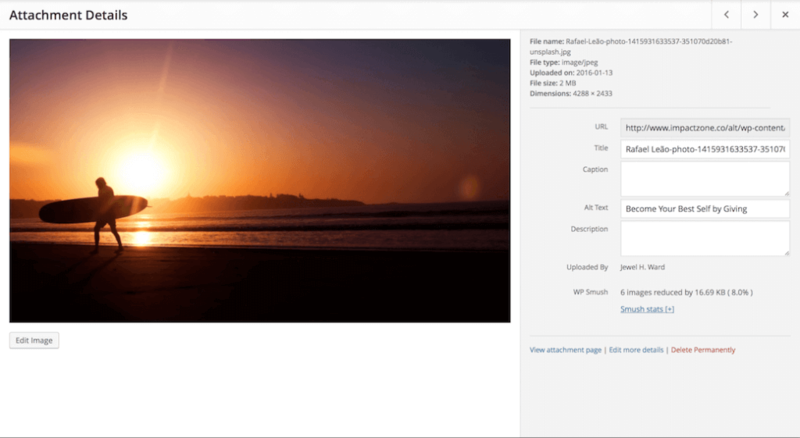 My photo theme on my blog posts relates to surfing and ocean waves. First, I’ll find a quote. Next, I’ll find a photo. 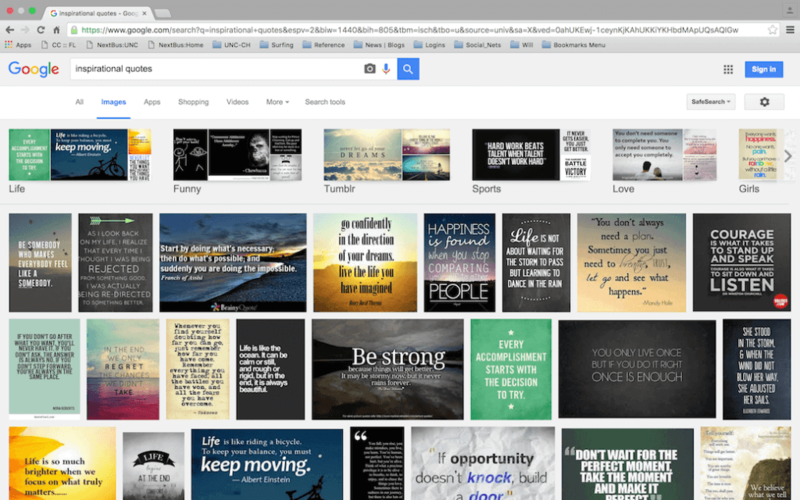 I’ll search on Google for inspirational quotes. 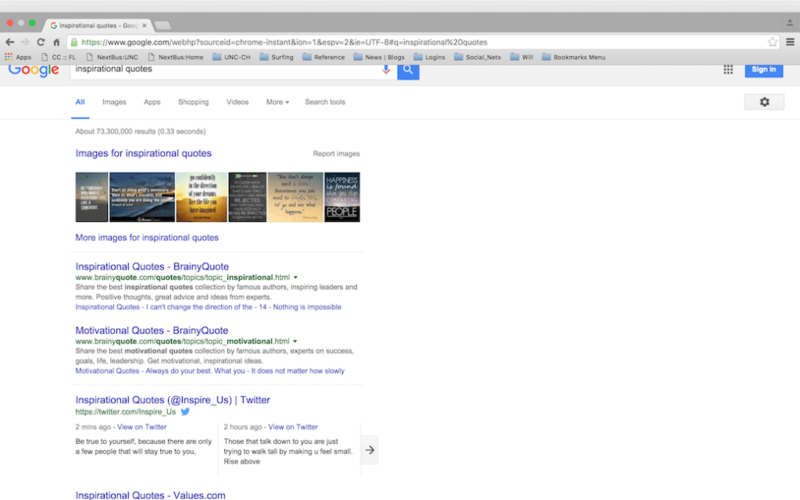 The results show me images, BrainyQuote, and Twitter. I decided to poke around on the images. During this phase, I am not quite sure what I want to post about, just that I want it to be inspiring. I have had some more serious motivational and inspirational quotes recently. In order to change it up a bit, I decide I want to have a funny motivational quote. Tumblr is fun, so I decide to see what Tumblr has to offer. Tumblr didn’t have anything I found interesting, but I found a section called “short inspirational quotes about life and happiness”. This hasn’t appealed to me, either. I remember that I wanted to do something about being your best self. 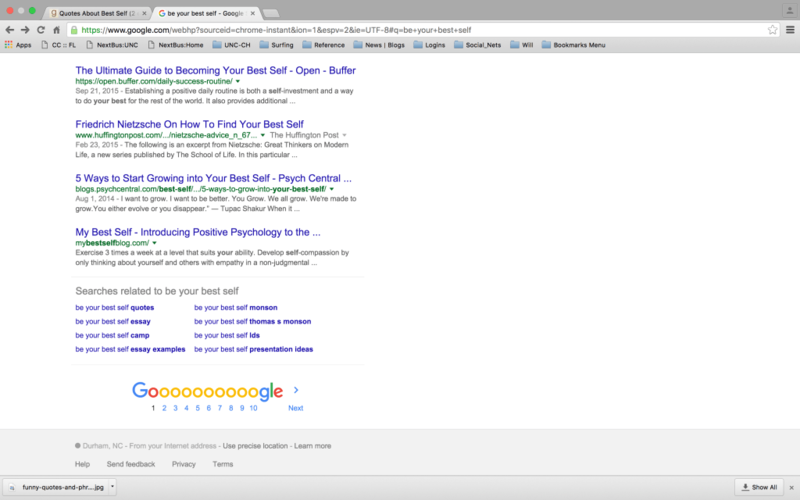 I go to Google and search for “best self”. The results are not very relevant, so I scroll down the page to look for related searches. I click on the link “be your best self”. 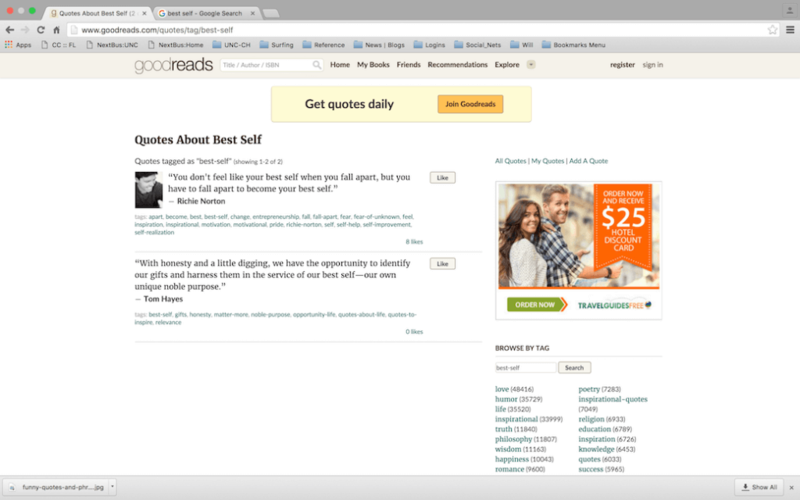 I find some quotes on Good Reads about self-improvement. As I skim the page, nothing strikes me as interesting. 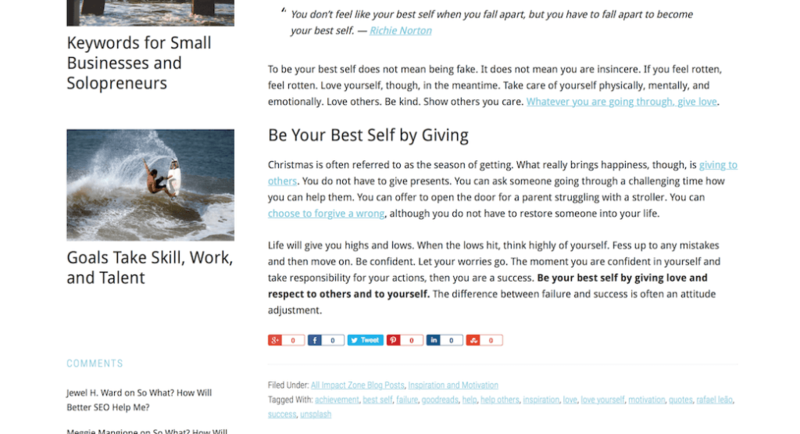 I change the stub at the top to end with “best-self” (the URL) instead of “self-improvement”. I examine the results. Now, I’ve got a quote. And a keyword. The keyword is “best self”. Now, I’m going to search for some phrases online, and see if I can incorporate those into my post. The initial results aren’t related, but when I scroll down the page to “related searches”, I find what I am looking for. 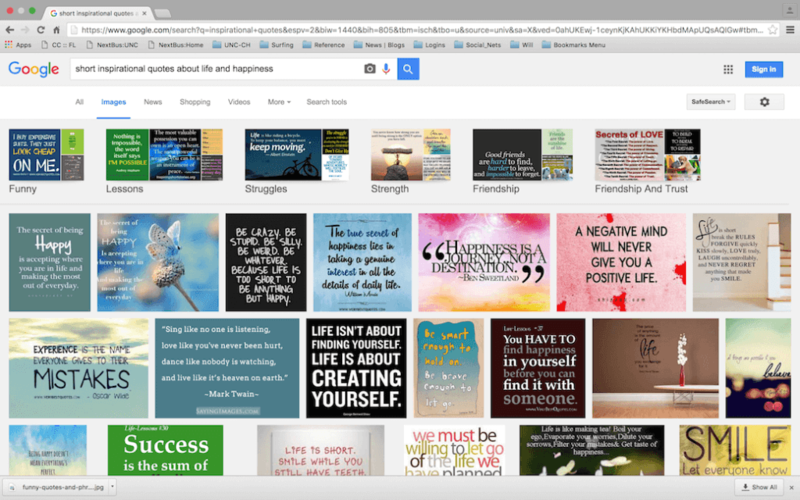 I click on the link for “be your best self” and Google displays these results. I read the first two articles for some ideas. 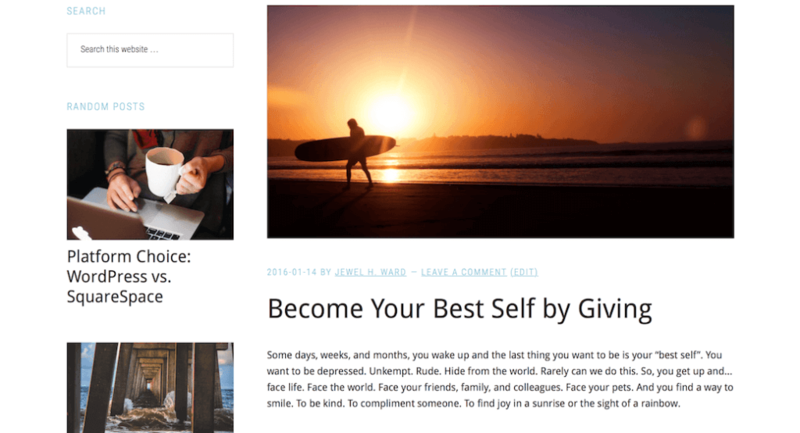 My motivational and inspirational blog posts are short, about 300 words are so. I want some ideas I can implement. As I work I think through what being your “best self” means to me. I scroll down to the bottom of the search results to see if I want to examine any more related search results. I do not. Now, I’m ready to write. I use WordPress, but I think you’ll find the same fields in most other platforms, including Squarespace. The technique is the same, though. You can use the following guidelines to maximize your SEO, regardless of platform. Your title should be about 50-60 characters. If you keep it under 55 characters, it will display properly and not be cut off in search results. You want a meta description of about 155 characters. 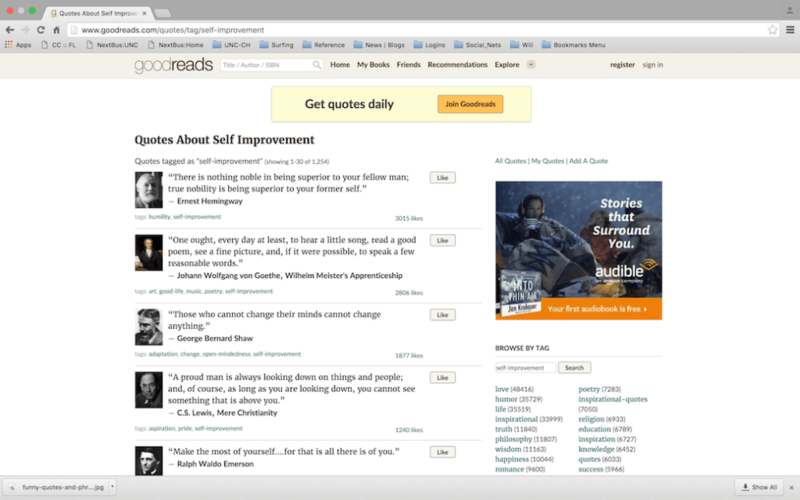 Your blog post ideally will be no less than 300 words but no more than 1000. You need at least one header tag that contains the keyword or phrase. The keyword needs to be in the title, in the URL, in the alt tag for the featured image, and in one of the header tags in the body of the article. One link to an outside source, preferably of high-quality content. Include the title in the URL stub, preferably without stop words such as “the”, “a”, or “and”, etc. There are websites that provide character counts, if your platform does not allow you to install a plugin similar to the Yoast WordPress SEO. Now, I’ll start writing the motivational post text. I cut and pasted the quote over and added the link to Good Reads. I then thought through the title and used something that is under 55 characters and sums up what I want to write. People will know when they read the title what this post is about. I checked off two categories, on the right. Once a category is a “real” category — Inspiration and Motivation”. The other category “All…” allows me to provide all posts in one category for purposes of the widgets I use on the front page. “All” is a technical category, so to speak. 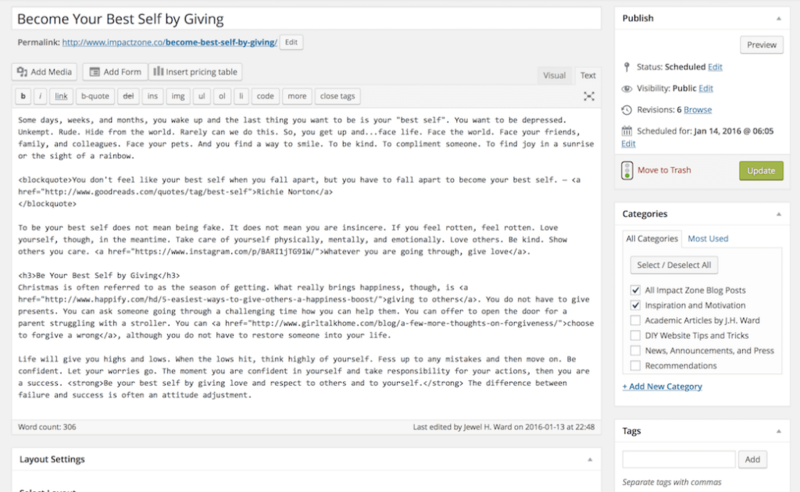 I added the title words to the URL stub (“become-best-self-by-giving”). I created tags. As I wrote above, you will want to limit tags to no less than five but no more than 15. I went to Unsplash and found a surfing-related image that I think represents the feeling I want to convey. I opened it up in photo editing software and changed the featured image size to 1038 pixels. This makes it easier to upload, and provides pre-optimization before I load it. WP Smush reduces the image further to make it load faster when someone visits the site. I upload this image to the Media file and then add information to the alt tag. I like to provide the photographer’s name, the original file number, and the location online in the title. In the “alt” tag, I use my blog post title with the keyword or keyword phrase. I leave the other two fields empty, but you can fill these if you want. Next, I’ll start building up the content. Then I’ll create a meta description for the post. And…after I run a few edits and check grammar and spelling, I’m done. There are as many ways to write as there are stars in the sky. I hope this post gave you some ideas on how to write to improve your SEO. This is simply one way to use keywords to build up a post and make it SEO-friendly. I would love to hear how you use keywords and phrases in your writing. 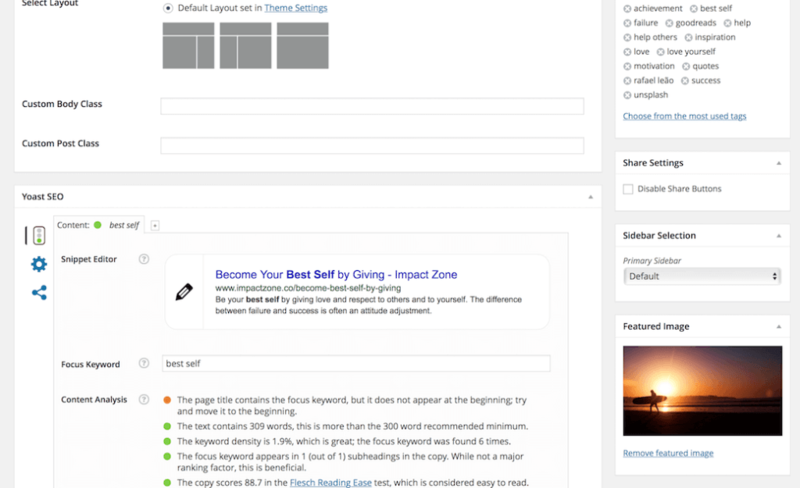 If you have any questions, comments, or suggestions about the sections Categories Versus Tags or Using Keywords in Blog Posts, please leave them in the comments below.